So, my kids got Webkinz for Christmas, and there’s a little snag. Using a Mac, OS 10.5.1, with a fully patched version of Safari 3.0.4 and a fresh install of Flash Player 9, I cannot see the confirmation code when trying to register a new account. I tried using a system with Ubuntu 7.10, Firefox 2.0.0.11, and Flash 9 as well, but could not see the login. 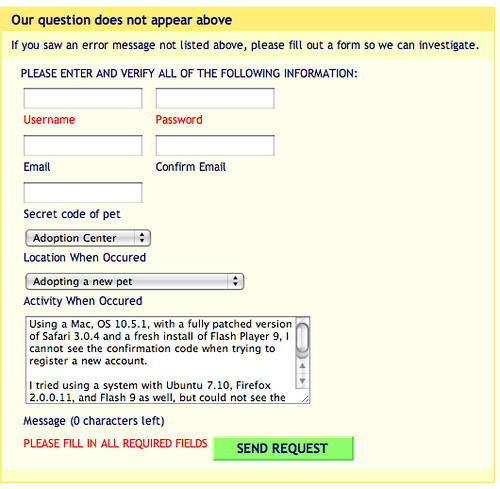 I clearly meet the Mac requirements, yet when I try to register – Bupkis. While I’m thrilled to see that Webkinz is trying to work with Macs – decent low end specs as their minimum requirements, I will not purchase any more Webkinz until they actually are compatible, or can tell me what’s wrong with my machines. And I do have to give them Kudos – on my Ubuntu machine (Firefox and Flash 9), everything was working flawlessly until the same breakpoint I got on my Mac. So it does look like Webkinz is making an effort to be cross platform. Postscript: I tried to do this with Parallels and an XP virtual machine, but that was running IE 7, so it didn’t work. 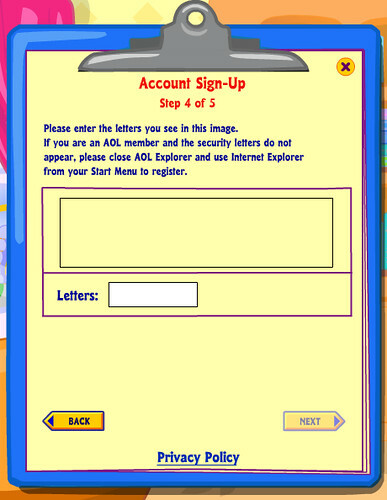 Finally, our computer for running Quicken, a Windows 2000 machine, was able to get us logged in. Not quite sure what the trouble was.